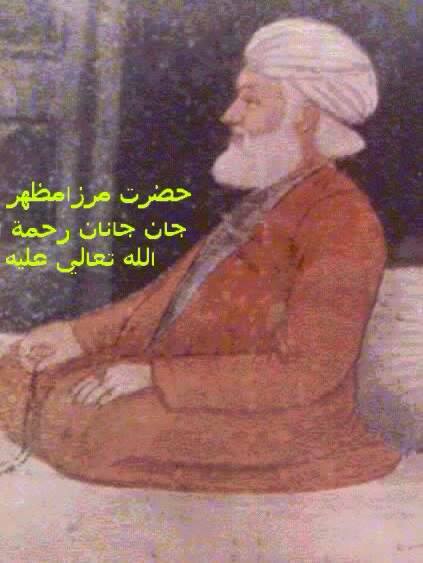 Hadhrat Mirzā Mazhar Jān-e-Jānān Shahīd, may Allah sanctify his secret, was born on Friday 11th Ramadān 1111 AH. He was an Alawi by descent, from the descendants of Sayyidina Imam Ali, may Allah be pleased with him. The great Mughal emperor Aurangzeb, who was also a follower of the Naqshbandi tariqah, suggested Jān-e-Jān as his name which later turned into Jān-e-Jānān. At the age of 18, he entered the servitude and spiritual studentship of Hadhrat Sayyid Nūr Muhammad Badāyūnī (1135 AH), a great Naqshbandi shaykh and a khalifah of Khwaja Saifuddīn Fārūqī Sirhindī (1096 AH). After four years, he received khilafah from his shaykh in the Naqshbandi Mujaddidi tariqah. When his shaykh passed away, he used to receive Fayd and spiritual training from the grave of his shaykh for about six years. 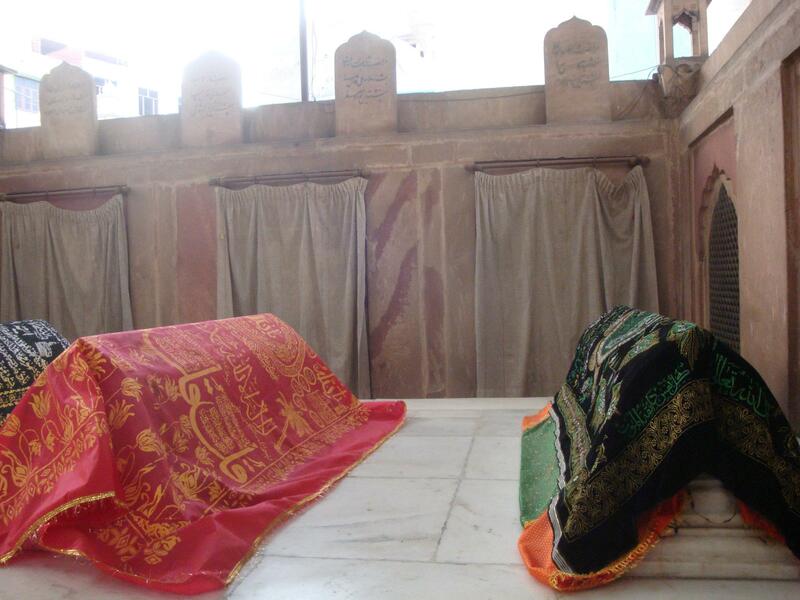 Hājī Muhammad Afzal Siyālkotī (d. 1146 AH) who received Nisbah from Khwājā Muhammad Naqshband Sirhindī and Shaykh Abdul Ahad Wahdat Sirhindī. 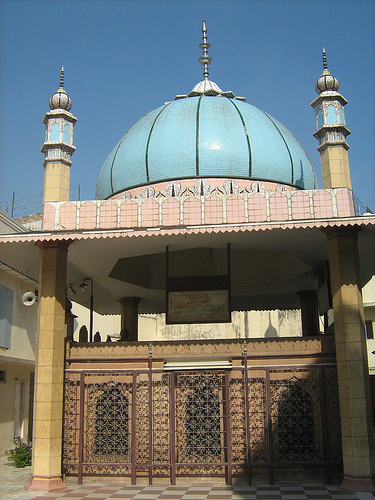 Mirzā Mazhar received the Ijāzā of Hadith from him. Among his famous pupils is the great Mufassir of the Holy Quran Allamah Qādī Thanāullāh Pānīpatī (1225 AH) who wrote many books in the sciences of Fiqh, Tafsīr, Tasawwuf, among them the Tafsir al-Mazhari. A list of his khulafa is available here. He was martyred by a Rafidhī who shot him with a gun on 7th Muharram 1195 AH, and he passed away to the eternal world in the night of Saturday 10th Muharram 1195 AH. 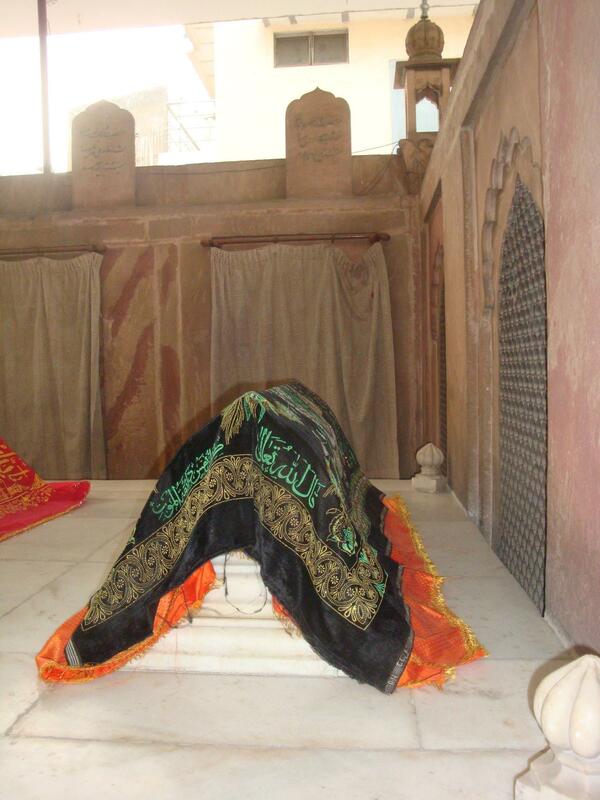 He was buried in his khānqāh in Delhi, India. The next in the Naqshbandī Mujaddidī Tāhirī spiritual golden chain is Shāh Abd-Allāh Ghulām-Alī Dihlawī. 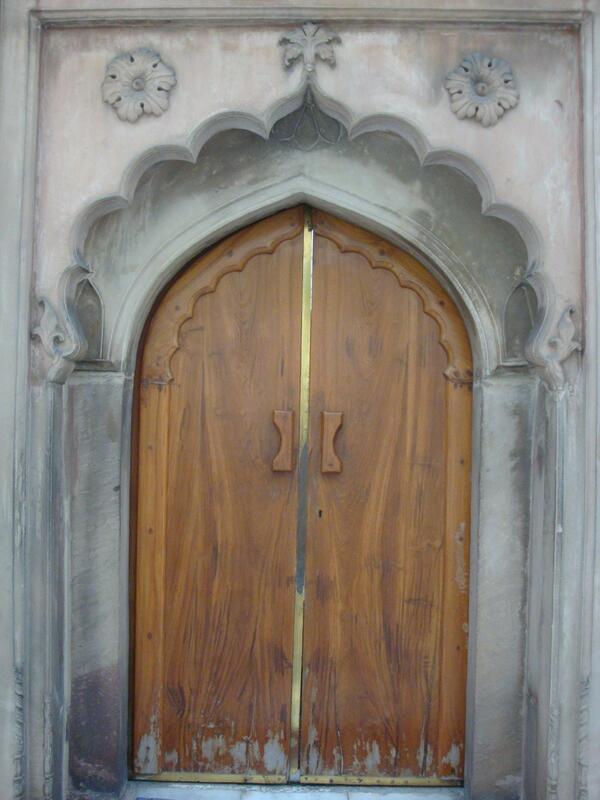 Door to a room which is purported to be the room where a fanatic Shia shot Hazrat Mirza Mazhar with a handgun, which led to his martyrdom. This entry was posted in India, Masha'ikh. Bookmark the permalink. So far I believed, on the strength of various treatises, that Mazhar Jan-e-Jana was murdered on the orders of King Farukh Siyar. What is exact location of “Khanqah Mazharia” Delhi Shareef. 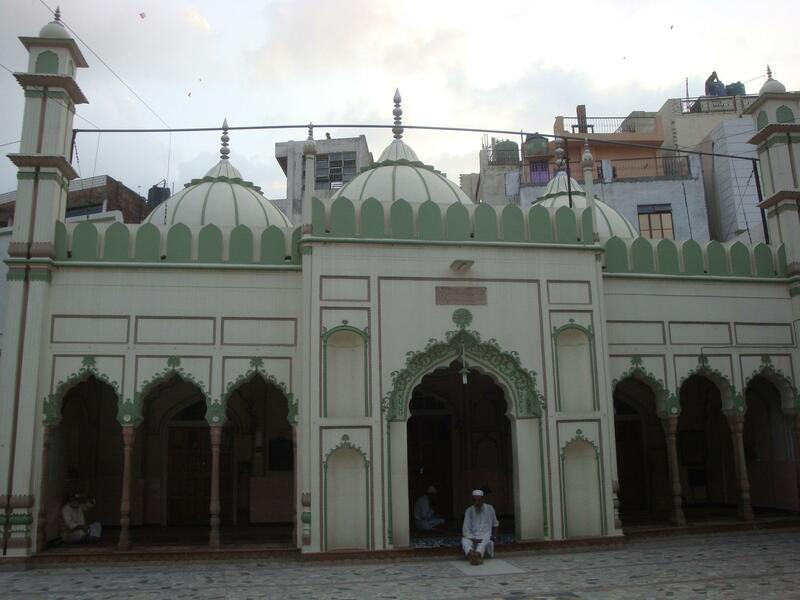 KHANQAH-E-MAZHARIA MARUFBBA KHANQAH GHULAM ALI DELHVI IS LOCATED IN OLD DELHI UNDER TURKMAN GATE THANA. IF U WANT TO GO FOR ZIARAH THEN ROOTS ARE FOLOWS. 1. From New Delhi Railway Station by rickshaw to Turkman gate. 10 mints by puller rickshaw n 15 mnts waking distance. 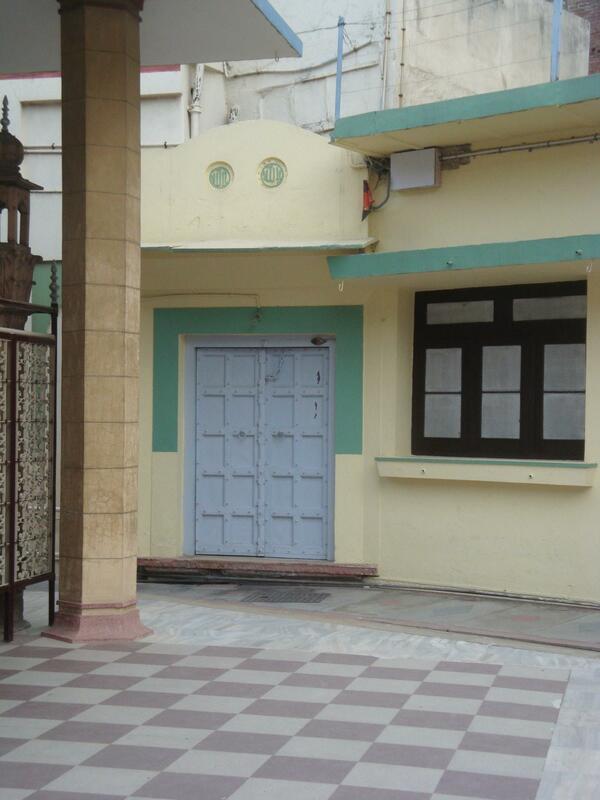 Complete address of khanqah is 2358 Dargah Hazrat Shah Abul Khair, Gali Kucha Mir Hashim, Shah Abul Khair Marg Delhi 110006. From Trukman Gate ask anyone to go Khanqah Sharif Shah Abul Khair. 5 mnts from Turkman Gate in Gali Kucha Meer Hashim. Opp of khanqah sharif is Hotel Al-Noor. Can you send me mail id of Shaik Anas Frooqi and his contact number, who is the current shaik of Khanqah Mazharia of Delhi Shareef. Is Mazhar Jan-e-Jana was murdered on the orders of Najaf Khan? Published: Cawnpore, Muṣṭafāʾī, 1271 . Naʻīm Allāh Bahrāychī, 1740 or 1-1803 or 4. Maʻmūlāt Maẓharīyah va Maḥbūb al-ʻārifīn. Lāhūr : Maṭbaʻ-i Muḥammadī, 1310 . نعيم الله بهرايچي. معمولات مظهرية ومحبوب العارفين. لاهور : مطبع محمدي. Widener Library, Harvard University, Cambridge, Mass.